If you’re planning a kitchen renovation, how you manage your remodeling project from the start will determine your satisfaction with the project at its completion. Consider this tip from the American Institute of Architects: good project management encourages an on-budget and on-time kitchen renovation. What role does project management play in your home project kitchen remodeling? Taking your kitchen remodeling idea from the design stage to planning and execution while overseeing each step along the way is your project manager’s job. Turning your kitchen remodeling cost estimate into a budget and, as much as possible, sticking to it, takes skill and experience. Your project manager will make sure your kitchen design plans conform to code, get the necessary permits, hire a contractor and/or sub-contractors and actively manage your remodeling project from start to finish. Who should turn your kitchen remodeling idea into a reality? 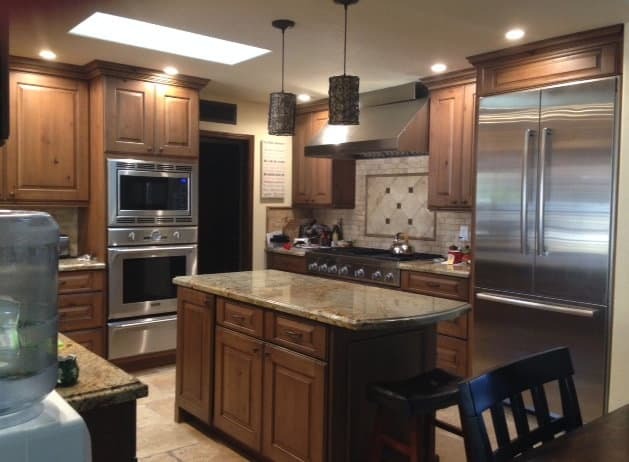 You have three choices as to who will manage your kitchen remodeling project. Making the right choice ensures that your kitchen remodeling cost estimate won’t balloon out of control and your kitchen design will be fully realized. If your kitchen remodeling project involves significant redesign, you’re probably planning to hire a designer. But did you know that some designers can also manage your renovation project? Kitchen designers have a vested interest in the quality control and design execution of your project–and in seeing their plans executed on budget as well. If you’re planning a kitchen renovation that involves three building trades (tile, plumbing and carpentry, for example), then you’re required to hire a general contractor. According to Residential General Contractor, a general contractor who acts as project manager might charge up to 25% of the cost of your kitchen renovation for the service. Relieved of project management duties, the fee drops by around 10%. This isn’t a cost-cutting tip, though, since someone will have to manage the project if your general contractor doesn’t. Planning a kitchen renovation is one thing, seeing it through to completion is quite another. If you act as your own project manager, you’ll handle every aspect of your kitchen remodel: contracts, permits, sub-contractor hiring and supervision, ordering supplies and day to day oversight of the project. Project management is a full time job and if you don’t have the experience for it, hiring a project manager may be the best kitchen remodeling idea you’ve ever had. Remember, anyone you hire to manage your kitchen remodel must be licensed, bonded and insured.